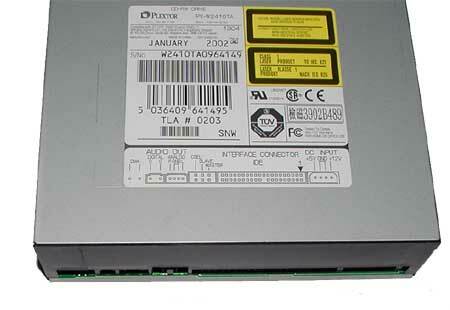 The PLEXTOR company is well known for its high-quality CD-RW drives. 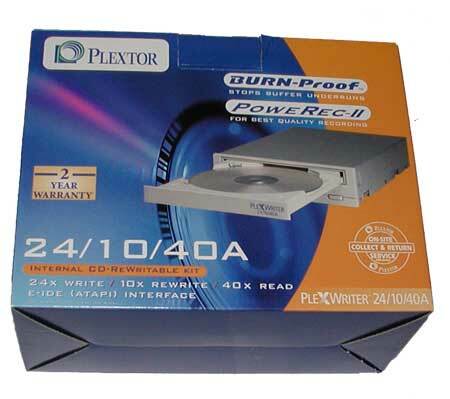 This time, I would like to introduce a Plextor´s 24x-speed drive - 24x speed means that a CD is created in about 5 minutes. Those who even do not find this enough attractive can browse for new powerful model 40/10/40A which is now available in two colors - black and classical gray. NERO 5.5.3.5 burning ROM - you should rather download the trial version 5.5.7.2 from Internet which functions as upgrade when you install the original version. CD with PLEXTOOLS - is a SW which contains functions such as: displaying information about the drive, detailed drive settings (e. g. BurnProof deactivation), information about medium, multimedia player, Wav and MP3 converter, "Create audio CD" function, copying of CDs at once and deleting CD-RW media. Electronic manuals in several languages (I recommend you should read them in order to get familiar with the drive). 1x data transfer cable for connection of disk controllers. 1x audio-cable for connecting of the drive to the sound card. 4x screws, 1x ejection button designed to help in case the CD gets blocked in the drive and a jumper for setting up the drive as Master or Slave. Brief printed installation manual in several languages. PoweRec II Technology (Plextor Optimised Writing Error Reduction Control) (plextor - powerec) - Technology designed to define proper maximum speed for burning media. Recommended configuration: CPU 300Mhz and higher, 64MB RAM, OS Windows 95 and higher. Hard disk with enough free space (20MB for software and c. 1GB for copying and creating CDs). Supported formats: burning modes - CD-ROM Modes 1 and 2, CD-XA Form 1 and 2, CD-DA, CD-I, Video CD & Photo CD. Creating Audio CD, CD Extra, Enhanced CD, Photo CD, CD-I & Video CD Titles. Plus - Support of nearly all new technologies and standards (BURN-Proof, PoweRec II, burning methods). Good reading and burning speed. 2 years warranty.